Promotional RB Acetate Blues Brothers Sunglasses are an amazing way to show off your brand logo or slogan in parties and celebrations. These custom Oahu Sunglasses consist of Black frames and smoke lenses. These custom sunglasses are also presenting 100% UV protection and are having 3/4" W x 1/4" H imprint space on the lens and 1-1/2" W x 1/4" H imprint space on the temple. 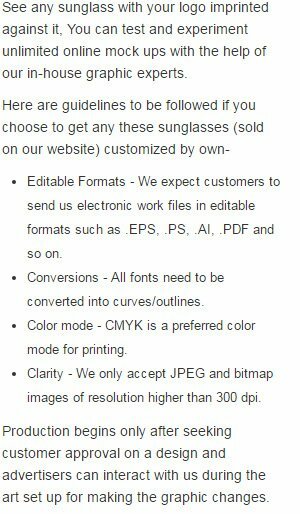 Order these sunglasses right away and get our free artwork design and free online proofs facilities. Request a quote to know price cuts that you can avail for wholesale Promotional RB Acetate Blues Brothers Sunglasses. When ordering blank items of this product either exactly 1 or atleast '+30+' must be ordered!